TWO 1", 22g stainless steel washer are hand stamped by me with the coordinates to the location of your choice or the name, date or short phrase of your choosing. Choose a birthplace, where you first met, where you shared your first kiss, or the location of a long distance loved one...wherever your heart is. After I hand stamp each number and letter one by one, I finish the washer with a light, rustic brushed finish. The washer hangs on a 24", 2.4mm stainless steel ball chain. I do have more feminine, delicate chains in the same great quality and length(1.5 mm ball chain). If you'd prefer the 1.5mm ball chain, please let me know in "note to seller" at checkout (I will send the piece made with the 2.4mm ball chain unless otherwise specified) Length can easily be adjusted by me or at home with a simple snip to the chain. Stainless steel is a fantastic silver alternative and makes a great option for men and women. It doesn't tarnish, it's strong, you can get it wet...it will last a lifetime! 1) The coordinates (latitude and longitude) OR address of the location or text that you would like stamped on the first washer (UP TO 25 CHARACTERS INCLUDING SPACES ONLY PLEASE). I use this website to find the latitude and longitude of the location you provide. You are welcome to use it to provide me with the coordinates or use your own source to provide the information. You are also welcome to let me find the coordinates for you by providing the address (be as broad or specific as you like, from city and country to street address, etc). 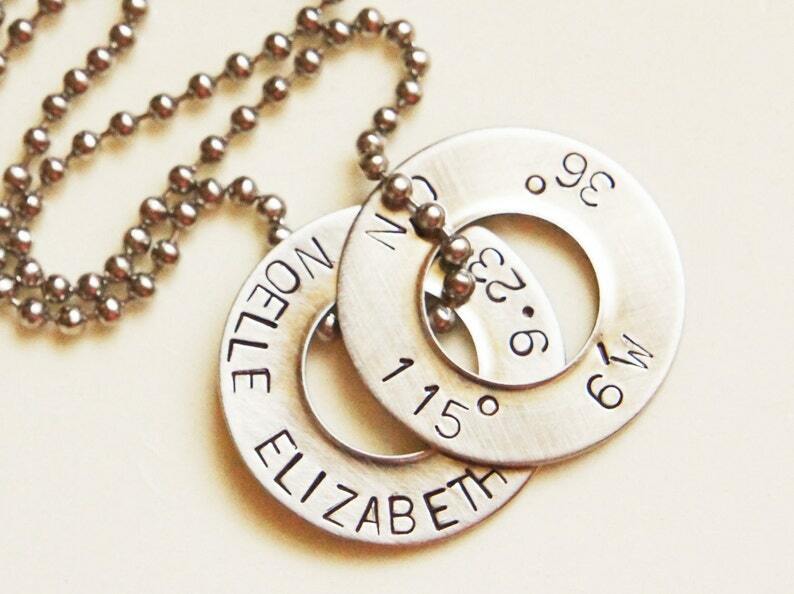 Your new latitude/longitude necklace will arrive in a black velvet drawstring bag, ready to give as a gift! Please contact me before purchase for current production time if time is an issue (current lead time can usually be found in my shop announcement, which can be found at the top of the main page of my shop here http://www.etsy.com/shop/RiverValleyJewelry?ref=seller_info ). Priority Shipping upgrade is availble, but please contact me for a custom listing before purchase if you need the item shipped Priority.